Home > Commercial Real Estate > Domestic Private Equity Investment Rising in India; 2017 May Set New Benchmark..! Domestic Private Equity Investment Rising in India; 2017 May Set New Benchmark..! Given the improving regulatory framework, India is now looking way more attractive to investors – both foreign and domestic – than ever before. The recent state election results have only reaffirmed that the central government will keep working on improving and introducing newer policies that are aimed at growth of different sectors, including the important real estate sector. This positivity will not only lend a huge impact when getting more foreign businesses and investments into India but also in improving the confidence of domestic investors. Already, in the last two years, a change has been witnessed in the private equity investment scene wherein investment from domestic sources has been exceeding that originating abroad. Most notably, the total private equity (PE) inflow (domestic) in 2016 crossed its peak seen in 2007. While the total PE inflow (domestic) investment in 2015 stood at USD 1,770 mn, it was almost double of that in 2016 at USD 3,410 mn. 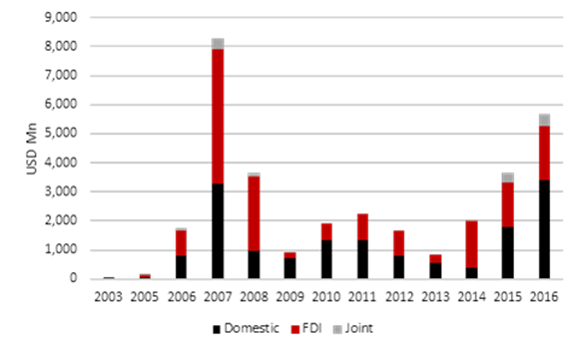 The corresponding figure in 2007, which was the previous peak, stood at USD 3,300 mn. Compare this to total PE inflow (foreign), which stood at USD 1,540mn in 2015 and USD 1,850 mn in 2016. The corresponding figure in 2007, which was the previous peak, stood at USD 4,600 mn in 2007. Looking at this data, it can be said that that equity investment is on a return journey to India and rising consistently in the last three years. Domestic investors seem to have realised the potential of Indian real estate aided by the improvement in India’s political and economic scenario and are investing more than ever before. Local knowledge also makes them more confident investors than their foreign counterparts that do not necessarily get to witness all the positive changes taking place in India. With many states on the verge of setting up a real estate regulator and REITs coming up, 2017 could very well set a new benchmark as far domestic PE inflows into Indian real estate are concerned.